BMC SANAYI VE TICARET A.S.
BMC, one of the most important national defence industry companies in Turkey, is utilising its advanced technology and vast experience in defence industry primarily to meet the demands of the Turkish Armed Forces, as well as those of other armies around the world. BMC produces Tactical Wheeled Vehicles, Aircraft Refuelers and Logistic Support Vehicles and Wheeled Armoured Vehicles (WAV). The quality of BMC defence industry products is certified with the “ISO 9001:2000 Quality System” and “AQAP-2110 Quality Assurance Requirements for Design, Development and Production for NATO” certificates. BMC has gained the title of “Company Manufacturing to NATO Standards,” and is a registered company of the NAMSA (NATO Maintenance and Supply Agency) Source Mailing List, which is a list of the companies allowed to carry out sales to NATO countries. BMC has the “NATO Secret” and “National Secret” Classified Facility Certificates, and is given a “Production License” by the Turkish Ministry of Defence. BMC has recently introduced its first (4x4) Mine Resistant Ambush Protected (MRAP) Vehicle. This vehicle is suited to meet the latest requirements of World Armies. With a seating capacity of up to 15-18 personnel, this vehicle has high ballistic and mine protection capabilities. 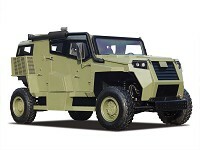 An order for 468 units of this vehicle has been received from Turkish Army. Another Armoured Vehicle, the Multi-Purpose Armoured Vehicle (MPAV) has also been introduced recently. Variants of this vehicle, such as Armoured Personnel Carrier, Command & Control Vehicle, NBC Reconnaissance Vehicle, TOW/MILAN Carrier, etc are ready to be produced. BMC also modernises Wheeled Armoured Vehicles. 302 units of BTR 60 (8x8) WAVs were renovated and delivered to Gendarmerie General Command in 1996. These WAVs are currently being used successfully in the field. Similarly, BMC is also capable of modernising BTR 80 (8x8) WAVs. BMC produces Tactical Wheeled Vehicles (TWVs) in 4x4, 6x6 and 8x8 configurations, with payloads ranging between 1 and 25 tons. Orders for 706 units of 2.5 Ton (4x4) TWV, 282 units of 5 Ton (4x4) TWV and 403 units of 10 Ton (6x6) TWV have recently been received from Turkish Army. 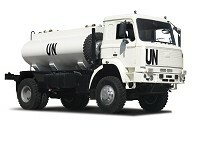 With the capacity to produce over 700 product variants, BMC also presents Logistic Support Vehicles such as Fuel Tankers, Wreckers, Fire Fighting Vehicles, Artillery Towing Vehicles, Water Tankers, Mobile Repair Shops, Ammunition Carriers, Ambulances, Command & Control Vehicles, Communication Vehicles, Shelter Carriers, Dumper Vehicles, Cesspit Emptiers, etc. 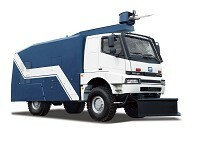 BMC''s special purpose vehicles include Riot Control Vehicle and Firefighting Vehicles. BMC produced the first Aircraft and Helicopter Refuelers in Turkey, capable of fuelling both military and civil aircraft. The refuelers are produced in compliance with NATO and NFPA (National Fire Protection Agency) standards in 5,000-20,000 lt capacities. The BMC PRO 827 (6x4) 20,000 lt Aircraft Refueler is the only type of its kind in the world with this capacity, and is transportable by military C-130 Hercules cargo aircraft. The 20,000 lt capacity aluminium body tankers are capable of refuelling F16 aircraft within three minutes. Recently, BMC completed deliveries of 2.5 ton and 5 ton Wheeled Tactical Vehicles, Military Communication Shelter Carrier Vehicles, Mobile Repair Shop Vehicles, EOD (Explosive Ordnance Disposal) Vehicles and Ammunition Carriers to the Turkish Armed Forces. 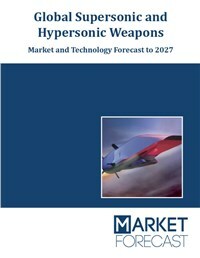 Further production of Tactical Wheeled Vehicles, Aircraft Refuelers and Mobile Repair Shops are underway and deliveries are to be made in the following months. For the armed forces of Allied Counties, BMC has recently delivered 2.5 ton and 5 ton Tactical Wheeled Vehicles, Recovery Vehicles, Aircraft Refuelers, Mobile Repair Shop Vehicles, Fuel Tankers and Water Tankers. BMC has completed deliveries of more than 100 BMC Aircraft Refuelers, in addition to the over 150 delivered to Turkish Armed Forces. BMC Tactical Wheeled Vehicles have been tested and approved abroad in all climates, including desert, hard winter and tropical conditions, and evaluation processes for various BMC vehicles are underway in some African, Middle Eastern and Asian countries.